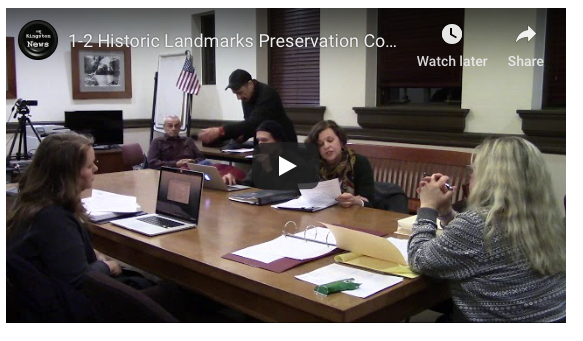 On Wednesday, April 4th, Marissa Marvelli and Alan Baer were invited into the Mayor’s office and abruptly learned that they would not be reappointed to the Historic Landmarks Preservation Commission, even though both wished to continue to serve. Under the charter, the Mayor has sole authority to appoint or remove members of all boards, committees and commissions. There is no oversight of those decisions by the Common Council. Marissa Marvelli is a historic preservation specialist with a master’s degree in the discipline from Columbia University. Alan Baer is an architect educated at the University of Cincinnati with continuing education at Xavier, Pratt, RPI, and Harvard. He had served on the HLPC for 17 years. Both are Kingston residents. The decision is believed to be part of the Mayor’s plan to merge the Historic Landmarks Preservation (HLPC) and Heritage Area Commissions (HAC). “Streamlining,” as it’s known, has been a contentious concept in the City of Kingston for years. It was included as a goal in the City of Kingston’s draft Comprehensive Plan by the consultant Shuster-Turner Associates (who were also involved in our 1961 Comp Plan that some experts say ushered in Urban Renewal in Kingston) and later removed after preservationists from around the city and the State Historic Preservation Office warned of its implications for Kingston’s standing in the state. To everyone’s surprise, the goal to streamline reappeared in the City’s Comprehensive Plan Zoning Recommendations that were released to the public in January of 2018. As Comp Plan Zoning is meant to reflect the goals of an adopted Comp Plan, many felt it had no business being there. Before a new Comp Plan Zoning group had been established, the executive branch delivered legislation to streamline commission to be reviewed by the Common Council. At that time, we had no idea what the motivation was for the City. KingstonCitizens.org with its partners spent most of last year advocating in support of the HLPC and HAC remaining independent commissions. We encouraged the Planning Department to create flowcharts and development guidebooks. (The Planning Department still doesn’t have these materials in any completed fashion even though the Planning Director has been in their position for over 30 years.) We also encouraged them to explore other ways to improve the review process for development projects, including coordinated reviews and a reconsideration of the HAC’s responsibilities. For months, we worked with members of the Common Council to make the case that streamlining commissions was the wrong approach. The concept was finally thrown out by the Council’s Laws & Rules Committee last year. Advocacy efforts to protect the HLPC all throughout 2018. At their March meeting, the HLPC, as an Involved Agency in SEQR for the proposed Kingstonian Project, discussed recommendations to submit to the planning board. Marvelli outlined the potential significant environmental impacts of the proposal. It is the Commission’s view that these impacts weigh towards a positive declaration, which would require a comprehensive, transparent public process that could help to improve the project on items that were within the HLPC’s purview. At last evening’s HLPC meeting, Hayes Clement was introduced as serving on both the HAC and newly appointed to the HLPC. These actions no doubt advance the Mayor’s goal to streamline commissions, overriding the outcome of the hard work by citizens and Council members over the past year. Following the news that Marissa was not reappointed, long-standing Heritage Area Commissioner and Kingston resident Giovanna Righini resigned. Their statements are available in full below. Statement delivered to the HLPC April 4, 2019. As you can see I am not sitting at the table with you tonight nor is Alan Baer. Yesterday we both got the boot from Mayor Noble. He told me he was dismissing me because our visions for historic preservation did not align. He also said I was not fit to be a Landmarks Commissioner. About his vision, the entirety of it can be summed in two words: merging commissions. It is the only preservation policy initiative he has put forward since he has been in office. He will point to the new administrator position that he recently created as evidence that he supports a strong municipal preservation program. While I agree it’s better than having no administrative support (which was our situation for more than a year), the annual salary—less than $19,000—is far from commensurate with the qualifications he seeks, which includes an advanced degree in historic preservation or a related field. I thought it was his administration’s desire to attract talented professionals to work in local government. I suppose it still is as long as that new talent is willing to work for peanuts. My vision—and I think the collective vision of this body in recent years—has been to increase the professionalism and credibility of the Kingston Landmarks Commission. I am incredibly proud of the improvements we have made together. First, we have come into compliance as a Certified Local Government by submitting annual reports and receiving annual commissioner training. This state-administered program provides us valuable technical support and grant funding. I hope we maintain our compliance going forward. Most importantly, I am proud of our engagement with applicants. Education, open dialogue, and reasoned decisions form the core of this commission’s service. It was my hope that in my tenure we would designate a new historic district and in tandem, have it nominated to the National Register so that property owners within it qualify for historic tax credits for undertaking rehabilitation work. It’s been 30 long years since this Commission last designated a historic district. However, with Kevin McEvoy’s help and the support of the Kingston Land Trust, a Preserve New York grant application was submitted two weeks ago to fund work to certify the Fair Street Historic District, which as you know is a local district only. With certification, property owners will qualify for the tax credits. I should add that certification is possible because Kingston is a Certified Local Government. It was also my hope to work with the Common Council to improve the existing preservation ordinance so that it is more in keeping with the 2014 New York State Model Preservation Law. I doubt that that effort will be moving forward now. It was also my hope that there would be a collegial working relationship between our Commission and members of the administration. Unfortunately, they are not welcoming of new ideas that are not their own. Some members tend to be obstinate, incurious, uncommunicative, and at times, resentful of being questioned. I would argue that some officials have occupied their desks for far too long to the detriment of our changing city. This Commission is the backbone of historic preservation in Kingston. This is why it is so incredibly important that this citizen body maintain an independent voice in city government. You are not here to carry out one mayor’s agenda nor should you be distracted with caring for a planter box in Uptown. Your legislative intent is to promote and protect Kingston’s landmarks and historic districts for the education, pleasure, and general welfare of our community today and tomorrow. Please keep your focus on that. Thank you for your service. It was an honor to serve with you. Marissa Marvelli is a Kingston resident and former vice chair of Kingston’s Historic Landmarks Preservation Commission. She works as a freelance historic preservation specialist for preservation-focused development projects and community groups seeking to protect their historic resources. She draws from a decade of experience with an award-winning Manhattan architecture firm and extensive involvement with non-profit preservation advocacy groups. She earned her Masters degree in historic preservation from Columbia University’s Graduate School of Architecture, Planning and Preservation. It was with great disappointment that I learned of your decision not to renew the appointments of Marissa Marvelli and Alan Baer to the Historic Landmarks Preservation Commission (HLPC). Through their involvement, the HLPC was finally beginning to transform into a strong organized force for historic preservation in Kingston. It has been refreshing to see an enthusiastic approach and a true professional understanding of preservation process: two things, which, quite frankly, have been lacking in the existing local preservation community and certain government departments. I understand that this could sometimes be at odds with what is considered politically expedient, but such is the nature of a healthy discourse. As a Heritage Area Commissioner and as a citizen of Kingston, the timing of your decision makes me very uncomfortable. With a huge project in Uptown currently on the table, hobbling the HLPC has the appearance of being a politically and financially motivated action. It does not serve our community well. And, worse, it does not serve the ideal of a democratic process for ALL members of our community. Sadly, it is with these thoughts in mind that I have decided to resign my position as Heritage Area Commissioner, effective immediately.